Geneva, Switzerland: The first of four treaties of the Geneva Conventions, The Convention Relative to the Treatment of Prisoners of War, is signed, defining humanitarian protections for prisoners of war. Germany and Italy sign, Japan does not. Spain: Day 11 of 985 of the Spanish Civil War. German and Italian transport planes arrive in Spanish Morocco to begin moving Nationalist troops to Spain. Spain: Day 376 of 985 of the Spanish Civil War. CBI - China: Day 21 of 2,987 of the 2nd Sino-Japanese War. Day 21 of 33 of the 2nd Battle of Hebei. Day 14 of 22 of the Battle of Tainjin-Beijing. Japanese troops begin a siege on the city of Tongzhou (Tungchow). Spain: Day 741 of 985 of the Spanish Civil War. CBI - China: Day 386 of 2,987 of the 2nd Sino-Japanese War. Day 47 of 139 of the Battle of Wuhan. CBI - China: Day 751 of 2,987 of the 2nd Sino-Japanese War. Day 44 of 68 of the Battle of Tianjin. CBI - Mongolia: Day 78 of 129 of the Battle of Khalkhin Gol, a border dispute between the Soviet Union and Japan. USA: Bugs Bunny makes his screen debut in the Oscar-nominated cartoon short A Wild Hare, the first of over 175 starring the wisecracking, wascally wabbit. Frame from "A Wild Hare"
A rabbit with some of the personality of Bugs, though looking very different, first appears 1938 in the cartoon short "Porky's Hare Hunt" and again in 1939's "Prest-O Change-O" and in "Hare-um Scare-um." 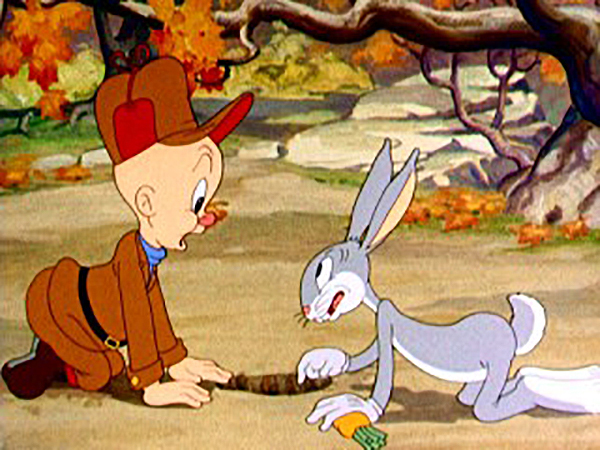 The cartoon short "A Wild Hare," directed by Tex Avery, is the first where both Elmer Fudd and Bugs are shown in their fully developed forms as hunter and tormentor, respectively. Though Bugs' name will not appear until his next cartoon appearance, in this cartoon Mel Blanc first uses what would become Bugs' standard voice. This cartoon also marks the first time that Bugs uses his catchphrase, "What's up, Doc?" The short was a huge success in theaters and was nominated for an Academy Award for Best Animated Short Film. Throughout the war, Warner Bros put its animated characters against buffonish depictions of Adolf Hitler, Benito Mussolini, and the Japanese. 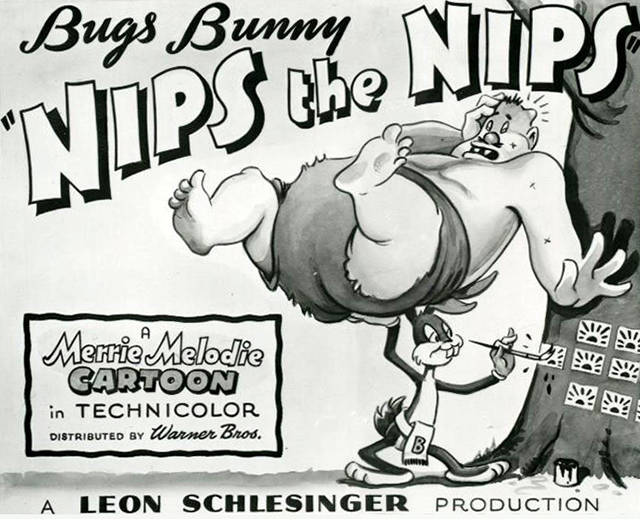 Lobby Card for "Bugs Bunny Nips the Nips"
The 1944 short "Bugs Bunny Nips the Nips" features Bugs at odds with a group of Japanese soldiers; a cartoon that has since been pulled from distribution due to its racial stereotypes of Japanese people. He also faces off against Hermann Goering and Hitler in the 1945 short "Herr Meets Hare," which introduced his well-known reference to Albuquerque as he mistakenly winds up in the Black Forest of "Joimany" instead of Las Vegas, Nevada. Atlantic: German sub U-34 attacks an Allied convoy 350 miles west of Scotland, sinking the British ship SAMBRE and the British tanker THIARA. ETO - UK: Day 18 of 114 of the Battle of Britain. The Luftwaffe attacks ships in the Channel, sinking the HMS CODRINGTON and HMS WREN while damaging others. East Africa: Day 48 of 537 of Italy's East African campaign in the lands south of Egypt. PTO - Japan: Japan announces its plans for the creation of the Greater East Asia Co-Prosperity Sphere. CBI - China: Day 1,117 of 2,987 of the 2nd Sino-Japanese War. Day 256 of 381 of the Battle of South Guangxi. South America: Day 23 of 27 of the Ecuadorian-Peruvian War, a territorial dispute between Peru and Ecuador. UK: The United Kingdom nationalizes all railroads for the duration of the war. ETO - UK: London is severely bombed by the Luftwaffe, This is the first air raid against London in over 10 weeks. Russian Front - Finland: Day 29 of 142 of Operation SILVER FOX, a joint German-Finnish campaign to capture the Russian port of Murmansk in the Arctic. Russian Front - Finland: Day 27 of 140 of Operation ARCTIC FOX, a joint German-Finnish campaign against Soviet Northern Front defenses at Salla, Finland. Russian Front - Finland: Day 36 of 164 of the Battle of Hanko. Russian Front - Finland: Day 18 of 18 of Finland's reconquest of Ladoga, Karelia. The Finns take the Lake Ladoga region northeast of Leningrad. Russian Front: Day 36 of 167 of Germany's Operation BARBAROSSA, the invasion of the USSR. Russian Front - North: German troops capture Tallinn, the capital of Estonia. Russian Front - Center: Day 22 of 31 of the 1st Battle of Smolensk, Russia. Fierce battles rage 25 miles to the east of Smolensk. Russian Front - Center: Day 4 of 38 of the Battle of Gomel, Belarus. Russian Front - South: Day 13 of 25 of the Battle of Uman, Ukraine. Hitler ask the Romanians to send additional troops into Ukraine to help out. MTO - Libya: Day 109 of 256 of the Siege of Tobruk. East Africa: Day 413 of 537 of Italy's East African campaign in the lands south of Egypt. CBI - China: Day 1,482 of 2,987 of the 2nd Sino-Japanese War. PTO - Japan: The Japanese Imperial General Headquarters officially decides to pursue a southern advance and to abandon their previous ambitions to invade Russia. Russian Front - North: Day 323 of 872 of the Siege of Leningrad. Russian Front - North: Day 84 of 658 of the Siege of the Kholm Pocket. Russian Front - South: Day 30 of 150 of Germany's CASE BLUE, the failed offensive to take the Caucasus oil fields. Russian Front - South: Day 5 of 20 of Germany's Operation EDELWEISS. German Army Group South captures Bataysk while 6th Army attacks the Soviet bridgehead near Kalach. MTO - Egypt: Day 27 of 27 of the 1st Battle of El Alamein. The Germans mount a counter-attack, bringing the battle to a stalemate. However, it does stop the Axis advance to Alexandra, making it somewhat of a victory for the Allies. East Africa: Day 84 of 186 of the Battle of Madagascar. CBI - China: Day 1,847 of 2,987 of the 2nd Sino-Japanese War. Day 74 of 124 of Japan's Zhejiang-Jiangxi Campaign, launched to punish anyone suspected of aiding the Doolittle raiders in China. Roughly 250,000 Chinese will be killed. PTO - Alaska: Day 51 of 435 of the Battle of Kiska, Aleutian Islands. PTO - Malaya: Day 159 of 357 of the Battle of Timor Island. PTO - New Guinea: Day 7 of 119 of the Battle of the Kokoda Track. 5th Air Force provides air support. The Australians continue evacuating from Kokoda. ETO - France: US 8th Air Force B-26s attack the Tricqueville Airfield. ETO - Germany: After nightfall, the RAF again bombs Hamburg. The fire storm it creates kills an estimated 42,000 people, most of them by carbon monoxide poisoning when all the air is drawn out of their basement shelters. Russian Front - North: Day 688 of 872 of the Siege of Leningrad. Russian Front - North: Day 449 of 658 of the Siege of the Kholm Pocket. Russian Front - Center: Day 23 of 50 of the Battle of Kursk, Russia. Russian Front - Center: Day 16 of 38 of the Battle of Orel, Russia. Russian Front - South: Day 5 of 23 of the Battle of Belgorod, Russia. Russian Front - South: Day 15 of 48 of the USSR's Lvov-Sandomierz Offensive. Soviets enter Poland, capturing Lviv. MTO - Italy: The new Italian government captures the Italian fleet. The prisoner Mussolini is moved from Rome to the island of Ponza. MTO - Italy: Day 19 of 40 of the Battle of Sicily. RAF and US Air Forces provide air support. As the heavy fighting continues, the Germans begin planning for an evacuation from the island to the mainland. CBI - China: Day 2,212 of 2,987 of the 2nd Sino-Japanese War. US 14th Air Force attacks shipping in the Samah Bay area of Hainan Island and targets on Stonecutter's Island near Hong Kong. PTO - Alaska: Day 416 of 435 of the Battle of Kiska, Aleutian Islands. US 11th Air Force attacks Kiska Island and Little Kiska Island. PTO - New Guinea: Day 97 of 148 of the 2nd Battle of Lae-Salamaua. US 5th and 13th Air Forces provide air support. PTO - Solomon Islands: Japanese sub I-168 sends a regular situation report which will become their last message. She has found the submarine USS SCAMP in the Steffen Strait between New Ireland and New Hanover. She fires a torpedo on the SCAMP but misses as it dives and evades the attack. Later, the SCAMP comes back and sinks I-168. PTO - Solomon Islands: Day 38 of 67 of the Battle of New Georgia. US 5th and 13th Air Forces provide air support. ETO - UK: Day 45 of 86 of the V-1 "Buzz Bomb" offensive on Britain. ETO - France: Day 3 of 29 of the Breakout Battle of Normandy. Day 3 of 7 of Operation COBRA. US troops keep pouring through the hole created by saturation bombing. German troops continue retreating from Normandy toward the Seine River. ETO - France: Day 52 of 62 of the Battle of Caen. Canadian troops continue attacking south of Caen. ETO - Belgium: US 8th Air Force B-24s hit the Luftwaffe communication center at Brussels, a coastal battery at Gravelines and industrial plants at Ghent. Russian Front - Finland: Day 2 of 19 of the Battle of Ilomantsi, North Karelia. Russian Front - Finland: Day 37 of 50 of the Battle of Karelia. Soviet troops continue their offensive against the Finns in eastern Karelia between Lake Ladoga and Lake Onega in northern Russia. Russian Front - North: Day 177 of 191 of the Battle of the Narva Isthmus, Estonia. Day 3 of 19 of the Battle of Tannenberg Line, Estonia. The Germans are successfully defending the Sinimaed Hills west of Narva. Russian Front - Center: Day 23 of 27 of the Battle of Siauliai, Lithuania. The Soviets capture Dunaburg (Daugavpils) in Latvia. Russian Front - Center: Day 23 of 23 of the Battle of Belostock, Poland. The Soviets take Belostock. Russian Front - Center: Day 15 of 15 of the Battle of Lvov, Poland. The Soviets capture Lvov. Russian Front - Center: Day 15 of 15 of the Battle of Stanislav, Poland. Stanislav falls to the Soviets. Russian Front - Center: Day 10 of 16 of the Battle of Lublin, Poland. The Soviets establish a major bridgehead across the Vistula River near Magnuszew, Poland. MTO - Hungary: US 15th Air Force bombs an armament factory at Budapest. CBI - Burma: Day 145 of 166 of the UK's Operation THURSDAY. US 10th Air Force provides air support. CBI - Burma: Day 140 of 147 of the Battle of Myitkyina. US 10th Air Force provides air support. CBI - Burma: Day 118 of 302 of the Chinese Salween Offensive. US 14th Air Force provides air support. CBI - China: Day 2,578 of 2,987 of the 2nd Sino-Japanese War. Day 102 of 259 of Japan's Operation ICHI-GO. Day 36 of 48 of the Battle of Hengyang. US 14th Air Force provides air support. PTO - Dutch New Guinea: Day 26 of 61 of the Battle of Noemfoor. Although the island has been declared secured, bitter fighting from Japanese continues. PTO - Mariana Islands: Day 4 of 9 of the Battle of Tinian. US 7th Air Force provides air support. PTO - Mariana Islands: Day 7 of 21 of the 2nd Battle of Guam. US 7th Air Force provides air support. Although this battle is declared as completed, it'll take two more weeks before it's really over. PTO - New Guinea: Day 62 of 83 of the Battle of Biak. There are still 3,000 Japanese soldiers on the island who won't give up. PTO - New Guinea: Day 226 of 597 of the Battle of New Britain. US 13th Air Force provides air support. PTO - New Guinea: Day 97 of 481 of the Battle of Western New Guinea. 5th Air Force provides air support. PTO - New Guinea: Day 44 of 80 of the Battle of Lone Tree Hill. PTO - New Guinea: Day 18 of 47 of the Battle of Driniumor River, a failed Japanese offense on US troops near Aitape. PTO - Solomon Islands: Day 270 of 295 of the Battle of the Bougainville Islands. US 13th Air Force provides air support. CBI: The USS BLENNY sinks three small Japanese vessels in the South China Sea off Malaya. The USS BUGARA sinks 3 small enemy vessels in the Gulf of Siam. CBI - China: Day 2,943 of 2,987 of the 2nd Sino-Japanese War. PTO - Borneo: Day 48 of 67 of the Battle of North Borneo. US 5th and 13th Air Forces provide air support. PTO - New Guinea: Day 578 of 597 of the Battle of New Britain. US 10th Air Force provides air support. PTO - New Guinea: Day 462 of 481 of the Battle of Western New Guinea. US 10th Air Force provides air support. PTO - Philippines: Day 280 of 299 of the 2nd Battle of the Philippines, aka the Liberation of the Philippines or the Philippines Campaign. PTO - Philippines: Day 225 of 244 of the Battle of Luzon. The battle is said to over but hold-outs will continue fighting until the end of the war. PTO - Philippines: Day 140 of 159 of the Battle of Mindanao Island. The battle is said to over but hold-outs will continue fighting until the end of the war. PTO - Philippines: Day 132 of 135 of the Battle of the Visayas region. The battle is said to over but hold-outs will continue fighting for several weeks.